Lux Deep IR is using for face, neck and abdomen skin tightening treatments for patients suffering from sagging or lax skin. These safe and effective treatments utilize infrared (IR) technology to gently provide skin tightening through soft tissue coagulation, stimulating the body’s natural healing response for visible results. We can reduce the appearance of skin laxity because we’re allowing the creation of new tissue. Our infrared light treatments go deeper into the skin than ever before, and the technology allows for safe treatment. Unlike other methods of skin tightening this method is much more comfortable because it leaves a significant portion of the skin unaffected by the infrared light. This allows for quicker healing and little to no downtime. Patients can receive a treatment and go back to work or other activities without any recovery time. How does Palomar Skin Tightening work? 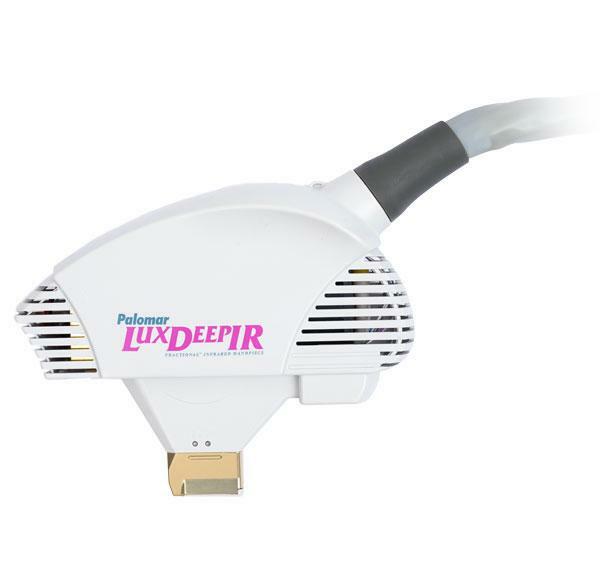 The Palomar LuxDeepIR FractionalInfrared Handpiece delivers infrared light by fractional beams deep into the dermis, stimulating the body’s natural healing response. This allows for the creation of new tissue, reducing the appearance of skin laxity on the face, neck, and abdomen. The result: a tighter skin appearance. Rather than using one large beam to deliver infrared light into the skin, the LuxDeepIR uses the “Fractional” approach: delivering an array of small beams. The beams create heated columns in the dermis, which are surrounded by an unaffected area. The unaffected tissue promotes faster healing. The LuxDeepIR Fractional method is much safer and more comfortable than the bulk heating approach of many other systems because it leaves a portion of the skin unaffected by the light pulses. The LuxDeepIR also uses 3-stage cooling. It cools the skin before, during, and after each light pulse, so you feel little discomfort during treatment. You may experience lingering warmth, tightness, or redness in the treated area, which fades within a few hours of treatment. Because a portion of the skin is unaffected by the light pulses, there is a quick healing process. Generally, you can receive a treatment and go back to work or to other activities without any recovery time. A series of treatments at 4–6 week intervals may be required to achieve the desired result of tighter skin in the face, arms, abdomen, and other areas. Your treatment provider will be able to give you more information about LuxDeepIR treatment and expected results.